A report on Deliveroo riders in Manchester taking their second day of strike action. Originally published on the New Syndicalist. The below article, originally published on the New Syndicalist, describes an IWW organiser's attempts helping to organise Deliveroo riders in Manchester for their second strike. You can read an earlier article here on how we organised our first strike. Since our strike on Valentine’s Day, riders in Dublin had been on strike over similar issues, as well as concerns over health and safety, after a video of a Dublin Deliveroo rider being attacked on the street went viral earlier that week. I hope the lessons I’ve learned and noted here can be of help in your organising, or encourage you to take that first step in building power for working people. If they have, get in touch – we all need all the help we can get! After the first strike there was a real change in nature of the Whatsapp group chat riders co-ordinate on.The tone of conversation was more mature and focused on the issues facing riders in Manchester, whether that be traffic cops looking to fine riders, people stealing their bikes, mopeds or phones. It was really good to see this – rooting the union in its member’s day to day interests and defence is crucial for proving its continued relevance to workers. What’s even better is that this was completely self-organised by the riders. The left can talk in abstract about solidarity or mutual aid, but seeing it come directly from workers in struggle is amazing. In the week or so after our strike, it was clear that Deliveroo refused to consider any of the demands we made. So, we organised another meeting. At the planning meeting we had representatives from the Middle Eastern and Eritrean Deliveroo rider communities there. Hearing from an Afghan rider who came here as a refugee, talking to Eritrean and Middle Eastern workers about the need to strike, and the relative benefits and freedoms they have here to act, compared to the countries they’ve come from was truly inspiring. Quotes of choice – “We’ve all ran before. We’ve seen strikes and protests fail, coups take over our countries, protestors put in jail. Here we’re free. Where else we gonna run?” and “I think like a communist – I want the working class to win instead of the rich. At least this once.” For all that sections of the left, and wider society, pose ‘reasonable concerns’ over immigrant workers undercutting wages of British born workers, here I saw riders from multiple different countries willing to unite for better pay and conditions. The majority of riders joining us on strike were, and have been, migrant workers. To be honest, I’m concerned that British born workers are undercutting their wages! We divided tasks at the meeting – a rider to sort out food for the rally, one to distribute leaflets amongst other riders, one to speak to riders who weren’t there who didn’t speak English etc. I took notes, but by the time I’d got back to our office to type them up, one of the riders had copied them perfectly by memory into the chat. Someone typing up and sending out the minutes you took before you even sat down to do them? I felt like I’d died and gone to trade unionist heaven. It was great to see these workers understand the need to escalate and continue action – to strike longer and harder, get more people out, get other cities out, to make the rally and strike fun and enjoyable, and provide for workers at the strike with food. Watching them understand Deliveroo was lying to them, and the effect their actions had on restaurants (riders spoke about Deliveroo hiring bouncers to protect restaurants from them, about Nando’s having 20 orders backed up and each one taking 45 minutes to be delivered) was also amazing. Hearing them on the picket say that they’d built Deliveroo as a company, and deserved what it owed them, was what every socialist dreams of. It’s a leftist platitude that a strike is the best education for workers. It’s also true. Whilst the preparation was still as stressful as anything (one hour had me praying to a God I’d long lost faith in, idly considering converting to Islam if the “Inshallah” and “Mashallah bro” texts I was getting worked, and reading horoscopes to try to determine whether the strike would go well), it’s remarkable how much more confident you feel after the first time doing something was successful. I was lucky that enough of the members who’d helped in the first strike were ready and willing to get stuck in again. A couple of hours after our meeting I asked one of the riders there to tell other riders about the strike, and to make sure they’d come out alongside us. If you geek out about organising and read books on it (like me), this is called getting a social leader to have one on ones with “hard” asks. He replied within minutes to tell me he’d already stopped all the riders he could see and told them about the strike. He’s never read a book on organising. He doesn’t need to. We were met with unseasonably beautifully sunny weather on the day. We picketed their Redhill Street office from 11 until 1.45pm, again being met with locked gates and security guards. Deliveroo’s approach to industrial relations reminds me of when you’re 13 and know your partner wants to break up with you, so you try and avoid them as long as possible! The picket at Redhill St.
On the picket we had Manchester college students on a TUC organising course coming over to support, with a donation for the strike fund! We were joined by friends from the RMT, Unite, Manchester Trades Council and ACORN, as well as Bradford and Northumbria IWW. Video of the picket at Redhill St.
Riders and supporters on the march to St Peter’s Sq. At St Peter’s Square, we held another rally outside their central Manchester office. More riders and supporters trickled in. After chanting and speeches we stopped for food and drinks brought along by a Deliveroo rider – homemade chicken shawarma, falafel wraps, and sandwiches. The riders held an impromptu whip round to support him. I tried to put some money in for him. The rider holding the thermal bag that acted as a collection tin was told by another rider, “He’s from the union. He doesn’t have to pay.” We later tried again to pay in private, thinking this might be an issue of pride for him. Again, our money was refused. Sometimes there is such a thing as a free lunch. Sometimes you get taught about solidarity by the people you’re meant to be organising. During the speeches, riders were encouraged to speak to the crowd of riders and supporters about how working for Deliveroo had changed over the last few years, and how that made them felt. Again, if you’re the sort of person who reads up on organising, you’d call this story-based organising or communications. The rider leading the speeches instinctively knew this was the best way to keep riders involved, and to build their confidence and anger. All the riders spoke about the pay cuts they’d suffered over recent months – some losing as much as half of their income. They also all spoke about the lack of support Deliveroo treated them with, and how their relationship with Deliveroo had changed from one of friendly care, to indifference to their childcare commitments, their illnesses or accidents suffered on the job. More than ever, these strikes seem the only way left for riders to assert themselves and their common humanity against a faceless and dehumanising company. From Deliveroo lying about attendance at our last strike, to refusing to negotiate or listen to the riders’ demands, Deliveroo’s own response proved one of the best motivators for our riders to continue taking action. This was echoed by a person attending the picket from Bristol, who mentioned that Deliveroo’s approach to riders in Bristol had been met with similar derision and militancy. Instead of cancelling shifts, riders kept them and cancelled orders coming through to their apps. Instead of asking restaurants to turn off their Deliveroo accounts, we left them running – Deliveroo would have to pay double for any late or cold food and complaints. Before the strike we had IWW members go out and leaflet riders, talking to every courier we could find, regardless of which company we thought they worked for (a lot of riders work for more than one company). We ended up speaking to scabs or potential scabs, trying (and succeeding in some cases) to win them over to the strike. We were explaining the concept of a strike to people who barely spoke English, or had no experience of trade unionism. We had to. There’s no excuse not to. Even on the day of the strike, we were trying to win over scabs working on the day. We had people working on the day come over to us, joining our strike. The only person we turned away was a drunk Chelsea fan – to the chants of “20 times Man United” from some of the more militant United fans and riders on the picket. Throughout the preparation and on the day itself, riders were in charge. They made decisions I didn’t necessarily think would be the best choices. Fundamentally, it’s their strike. Before the strike, I offered to go round restaurants again and suggest they turn off their Deliveroo accounts. The riders didn’t want this. I thought this was risky. Riders ended up cancelling hundreds of orders during the strike, turning down the equivalent of thousands of pounds. Sometimes you have to take a risk. I’m really fortunate that I could rely on certain union activists to take on key roles during the day and in the build up to the strike. Delegating tasks is something I’ve always struggled with, but I feel more confident that I can do this now. Key rider activists were also able to divide up tasks between them, and give tasks to riders who hadn’t had these in the first strike. I’m thinking of the rider who brought us all homemade lunch on the picket, in between leading chants and speeches. Or the riders bringing other riders out on our strike. Or our new members getting through the extra leaflets we’d printed off in record time. We wouldn’t have been able to do it without these riders and members. The support we’d shown the RMT in their dispute with Northern Rail was repaid with their younger guards coming to join us on our strike. The same for ACORN. If you’ve ever thought “Nah, I’ll leave it for today”, think again – you never know when you’ll need to call in a favour. It’s even better when you don’t have to call it in – the friends you’ve made on picket lines or in the pub afterwards turn up to your struggle uninvited, but always welcome! I’m thinking of the students from the TUC organising course at Manchester College, who spent their 40 min lunch break coming over to our picket, and giving us a donation of about £45 gathered in a whip round from their class. Whilst that doesn’t sound like a lot, for us it’s another round of leaflets. Or a third of what we spent on food. Or another 5 placards. We didn’t ask for it. It’s one of the nicest surprises I’ve had. If you’d asked me three years ago would I expect 3 CLPs and 2 Momentum branches to support unofficial strike action from a non-TUC affiliated union, I’d probably have said “WTF is a CLP?” When you’d explained it, I’d probably have laughed you out of the room. I’ve never been happier to say past me is an idiot. The support we had from Manchester Momentum and Piccadilly, Hulme and Central Manchester Labour was really impressive. A party which has gone from never officially supporting strikes to getting behind this kind of grassroots action in such a short space of time is amazing. Excitable PhD students, academics and start up tech bros will all imply that Deliveroo is some new forefront of capitalism. That might be true, but the working conditions Deliveroo imposes and the strategies they use to deal with striking workers are as old as the working class itself. And so are the tactics we use to fight back – identifying and winning over social leaders, getting a critical number of workers to strike, getting other organisations to support you in your strike, and being willing to escalate this until you win. 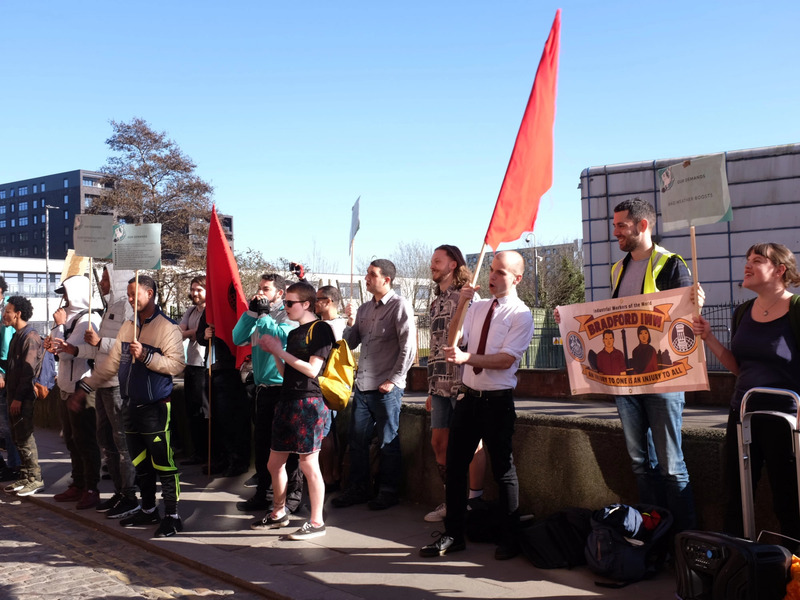 We’ve organised two strikes and had 4 students and one museum contact us for interviews and to ask for help from us with their degrees or work. Whilst I’m happy to help out, if you’re ever in a similar position, offer to help the organisation whose time you’re taking up for free, yeah? Or organise a strike with UCU or the NUS and write about that instead – the best lesson you’ll ever have! Unfortunately, the appetite for action in other areas of the UK wasn’t there in the build up to our strike, meaning Manchester was the only city on strike this day. It was heartening to see the IWW Brighton group choose the day we were striking to go out and leaflet riders about the IWW’s organising drive. Increasingly, the IWW is being recognised as the union for couriers in the UK. If you have an evening free, I’d encourage you to get in touch with your local branch to see if you can help. We need to do more to coordinate action on a national, and international, level to take on Deliveroo. Although that’s easier said than done! We’ll probably need more than just strikes to win against Deliveroo. The court case going through the High Court between Deliveroo and IWGB for limb b worker status and trade union recognition is promising, although it’s worth noting that worker status is a demand that’s fairly controversial amongst riders. The agreement GMB reached with Hermes is another promising step forward in industrial relations in the “gig” economy. Fundamentally, this area of employment and trade union law needs updating to reflect the conditions on the ground. No Love for Deliveroo! A reflection on organising and mobilising in the “gig” economy. Mass Sackings at Deliveroo – What can I do about it? Watching them understand Deliveroo was lying to them, and the effect their actions had on restaurants (riders spoke about Deliveroo hiring bouncers to protect restaurants from them, about Nando’s having 20 orders backed up and each one taking 45 minutes to be delivered) was also amazing.